A laid-off defense worker, kept from seeing his child on her birthday by a restraining order, looks at the landscape of moral decay in Los Angeles on one hot, congested day and, after being mugged, snaps. What follows is his bitter and pathetic mission of justice, vengeance and vindication that reads uncomfortably like too many news stories. Michael Douglas is identified only by his character's license plate, D-FENS, in this attack on social ills, a film originally seen as the displacement of power felt by many white American males. $8.724 million on -unknown- screens. • Audio Commentary with Director Joel Schumacher, Editor Paul Hirsch, Screenwriter Ebbe Roe Smith, LA Times Writer Shawn Hubler, and Actors Michael Douglas (circa 1993), Michael Paul Chan, Vondie Curtis-Hall, and Frederic Forrest. While best known for “style over substance” flicks like The Lost Boys and Batman and Robin, director Joel Schumacher occasionally attempts something a little darker and more serious. In that vein, he created 1993’s Falling Down, a tale of urban anxiety. Bill Foster (Michael Douglas) leads a quiet life, but he grows increasingly fed up with the little bits of indignation he seems to endure on a daily basis. When he feels pushed too far, he finally snaps. Stuck in one of LA’s patented never-ending traffic jams, Foster abandons his car on the freeway and declares he’s going home. We follow his circuitous, confrontational path. First Foster gets into a tussle with a Korean convenience store owner (Michael Paul Chan) who he feels overcharges for his goods. Foster then runs into some Latino gang-bangers and chases them off with the baseball bat he took from the Korean store. Foster’s escapades escalate in intensity and violence as he works his way toward the home of his ex-wife Beth (Barbara Hershey) even though she has a restraining order out on him. Along the way, a soon-to-retire cop named Prendergast (Robert Duvall) gets involved. During his last day on the job, he sees a thread among the various incidents. He pursues these leads and tries to stop Foster before matters go over the top. When Falling hit screens in 1993, it caused quite a stir. After all, it appeared less than a year after the LA riots that greeted the Rodney King verdict, so it seemed awfully timely. 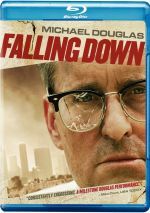 Falling doesn’t directly tap the same subject matter; the LA riots were more firmly connected to racial injustice, while the film visits the degeneration of society in a more general way. Oh, we occasionally get a sense of Foster as a racist, but I don’t think that perception is accurate. Like John Doe from Se7en, he’s more concerned with the actions of the various folks than with their skin color. Still, there’s the same sense of the social tension that came to the fore in April 1992, so Falling connects with its era. 23 years later, it still feels timely; after all, it’s not like the world has suddenly become a happier, sunnier place. If anything, people have become ruder and more self-absorbed over that period, as smart phones allow folks to dig even deeper into their own little cocoons. A more skilled director could’ve really explored this territory in a satisfying way, but Schumacher is too superficial. He prefers bits of cheap symbolism. For instance, during the tussle at the Korean convenience store, the participants knock a jar of little American flags to the floor; it breaks and spills the flags on the ground. This kind of imagery seems obvious and tacky; it doesn’t add anything to the film and simply distracts us. More problematic, however, is Schumacher’s inability to find a consistent tone for the movie. He doesn’t seem sure if he wants this to be a harrowing journey into madness or a light spoof of societal rudeness. The film takes itself too seriously to become a satire, but it’s too silly for the audience to buy it as a realistic drama. Maybe Schumacher thought he needed some light moments to temper the tension, but most of those bits just feel out of place. Take the scene at the burger joint. The employees wear goofy hamburger hats that distract us because they’re unrealistic – I’ve never seen silly caps like that at any fast food place – and dopey. It feels like the art director got to Schumacher and they went with the easy laugh instead of realism. Again, if the movie went down a more consistently satirical path, bits like that would be acceptable. That happens again in the scene with the panhandler who can’t do anything right. C’mon – who’s dumb enough to claim he hasn’t eaten in days when he has a hamburger in his hand? The movie jumps from darkness to light comedy in the blink of an eye, and all those shifts undercut the various elements. But Schumacher was never one for subtlety. In the film’s world, everything reinforces the story’s point. Funny how everyone Foster encounters is so intensely rude; wouldn’t you think he’d occasionally run into someone who doesn’t act like a total jerk? But that’d undercut the flick’s theme, and Schumacher can’t allow anything to interfere with his one-dimensional portrayal of events. At least the actors bring some depth to the material. Foster is essentially a caricature of the Angry White Man, but Douglas makes him borderline sympathetic. He’s too nuts and too cruel to become a likable character, but at Douglas ensures that he isn’t just a cartoon. Duvall brings the most verve to the movie. He gets an underdeveloped character, and the arc with his needy, pushy wife seems unnecessary; poor Tuesday Weld is stuck with the role as the harpy who controls him, and I think the movie would be better without her. Prendergast’s tale works just fine without her intrusions, and Duvall adds a lot of spark to his take on the role. Falling Down remains an interesting movie despite its flaws. While a different filmmaker could’ve made something great out of it, I will acknowledge that it’s still more than watchable under Schumacher’s direction. Nonetheless, I can’t help but view it as a missed opportunity and a movie that could’ve been much more dynamic with a more skilled storyteller behind the camera. Falling Down appears in an aspect ratio of approximately 2.35:1 on this Blu-ray Disc. The image held up well over the decades. Sharpness appeared positive most of the time. A few wide shots showed a smidgen of softness, but not to a substantial degree. Instead, the majority of the flick provided good clarity and accuracy. I saw no issues with jaggies or shimmering, and edge haloes remained modest. No print flaws became an issue here, as the film looked clean. The palette of Falling Down went with a sensibility to match its stressful environment. This meant a generally arid set of colors that reflected a sweltering day and an intense mindset. Within those parameters, the colors worked well. Blacks seemed dark and tight, and shadows presented good delineation. Overall, this was a quality transfer. Audio quality always satisfied. A little edginess occasionally affected speech, but the lines were usually natural and distinctive. Music showed nice range and definition, while effects were clear and concise. The louder bits demonstrated decent bass response. Nothing here dazzled, but the track was perfectly satisfactory. How did the Blu-ray compare to the DVD from 2009? The audio was a little fuller and richer, while visuals seemed tighter and cleaner. The Blu-ray presented a good step up in quality. The Blu-ray duplicates the DVD’s extras, and we open with an audio commentary from director Joel Schumacher, editor Paul Hirsch, screenwriter Ebbe Roe Smith, LA Times writer Shawn Hubler, and actors Michael Douglas (circa 1993), Michael Paul Chan, Vondie Curtis-Hall, and Frederic Forrest. The commentary compiles a bunch of separate interviews and mixes them into this edited piece. The track looks at themes and characters, the film’s tone, story, script and development, cast and performances, editorial choices and the approach to the material, LA locations and the city’s climate in the early 90s, and a few production tidbits. Despite the presence of so many participants, the commentary suffers from a surprising amount of dead air. Oh, you won’t find acres of space, but matters go silent more often than I’d expect. Nonetheless, we get a fairly good look at the film here. Story/character notes come to the fore, and the actors contribute nice insights. There’s enough useful information to make this one worth a listen. In addition to the film’s theatrical trailer, we get a featurette. Deconstructing D-FENS: A Conversation with Michael Douglas runs 10 minutes, 11 seconds and includes the actor’s thoughts about the project and why he took it, his character and performance, the film’s use of LA, and his impressions of some specific scenes. Douglas provides a fairly introspective take on the flick and his involvement in it. Some directors elevate material, while others take potentially great work and make it ordinary. Joel Schumacher falls into the latter category, and he ensures that Falling Down never lives up to its potential. The movie entertains and keeps us occupied, but it suffers from too many flaws to even flirt with greatness. 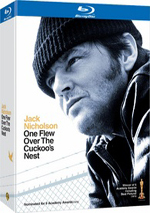 The Blu-ray offers positive picture and audio as well as a couple of useful bonus materials. This turns into a good release for an interesting but erratic film.